and recorded extensively with his wife Fran later in life. Clarence Hollimon, pictured left, and fellow musicians at the former headquarters of Duke and Peacock Records. Courtesy of Houston Press. Image available on the Internet and included in accordance with Title 17 U.S.C. Section 107. HOLLIMON, MILTON HOWARD CLARENCE (1937–2000). Blues, jazz, and rhythm-and-blues guitarist Milton Howard Clarence Hollimon was born in Houston on, October 24, 1937. Clarence, as he was known, was widely acknowledged as one of the greatest guitarists in his musical genres. During the forty-six years of his professional career he appeared on countless recordings produced in Houston as well as in other cities across the nation (including Austin, Los Angeles, New Orleans, New York, and Providence, Rhode Island) and in Germany. With his wife, singer, pianist, and fellow recording artist Carol Fran, whom he married in 1983, Hollimon toured widely in the United States and abroad and performed at the 1996 International Olympics celebration in Centennial Park, Atlanta. He also received the Texas Black Caucus Entertainer of the Year award in 1987 and the Jazz Heritage Society's Guitarist of the Year award in 1989. Hollimon initially dropped out of Wheatley High School, in Houston's Fifth Ward, in 1954 to play guitar full-time with the famous blues orchestra led by Bill Harvey. The artists he backed on his first road tour included Clarence "Gatemouth" Brown and Willie Mae "Big Mama" Thornton. This affiliation with Harvey eventually led to an opening for Hollimon to work for the Duke and Peacock labels, owned by Don Robey. From 1957 to 1962 Hollimon proved to be a brilliant session guitarist, performing mainly under the direction of legendary producer Joe Scott. He provided guitar accompaniment for such blues singers as Bobby Bland, Joe Hinton, Junior Parker, and O. V. Wright, as well as gospel singers such as Rev. Cleophus Robinson and groups such as the Mighty Clouds of Joy, the Dixie Hummingbirds, and the Five Blind Boys. Hollimon also worked during the late 1950s and early 1960s for artists not linked to the Duke and Peacock labels. He married and had two sons. Between 1956 and 1960 he intermittently toured and recorded (on the King label) with pianist Charles Brown, a Texas native who had moved to California. In 1964 he temporarily moved to New York to do session work at Scepter One Recording Studios. Among the pop singers he backed during his tenure there were Dionne Warwick and Maxine Brown. Following his return to Houston the next year Hollimon assumed a salaried position as a Duke-Peacock studio guitarist, but he still worked locally during this period on other recording projects, including sessions with jazz bandleader and saxophonist Arnett Cobb. It's About Time Album by Clarence Hollimon and wife, Carol Fran. Image available on the Internet and included in accordance with Title 17 U.S.C. Section 107. 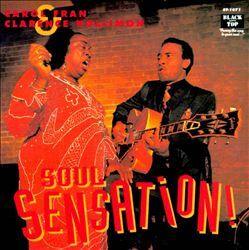 Soul Sensation Album by Clarence Hollimon and wife, Carol. Image available on the Internet and included in accordance with Title 17 U.S.C. Section 107. Clarence Hollimon performing. Image available on the Internet and included in accordance with Title 17 U.S.C. Section 107. Throughout the later 1970s and early 1980s Hollimon's musical productivity waned, especially during a period of substance abuse. However, his relationship with Carol Fran helped him regain his former prowess. Though the two had initially met around 1958 in New Orleans at the famous Dew Drop Inn, it took a chance crossing of paths some twenty-five years later (at a blues jam in a Houston nightclub) to make them a couple. That union, which billed itself professionally as Fran and Hollimon, eventually evolved into what was likely the most widely traveled and recorded husband-and-wife blues duo in Texas history. During that time they not only played marquee concert halls in numerous cities overseas, as well as major festivals nationwide; they also logged hundreds of hours traveling around the Lone Star State to perform concerts and serve as artists-in-residence in programs sponsored by the Austin-based organization Texas Folklife Resources (now Texas Folklife). The couple recorded several compact disks in the final decade of the twentieth century. Following Hollimon's featured guest role on the Grady Gaines disk Full Gain (1988), Fran and Hollimon first collaborated in the studio as contributors to the compilation Gulf Coast Blues, Volume One (1990), followed by appearances on Gaines's Horn of Plenty (1992); then they released their first full album as a team, Soul Sensation (1992), and its sequel, See There! (1994), all on the Black Top label. In 2000 they released their final recording as a duo, It's About Time, on the JSP label. Meanwhile, Hollimon remained in demand as a session guitarist during the final years of his life. He did studio work for various Texas blues singers, including his former Duke-Peacock colleague Lavelle White, who featured him prominently on her CDs Miss Lavelle (Antone's, 1994) and It Haven't Been Easy (Discovery, 1996). And Hollimon provided all the guitar work for the W. C. Handy Award–nominated 1999 CD Rockin and Shoutin the Blues (Bullseye Blues and Jazz) by Houston vocalist Jimmy "T-99" Nelson. Hollimon was known to his closest friends and musical associates by the nickname "Gristle." He died of natural causes at his Houston home on April 23, 2000.
: Clarence Hollimon with Carol Fran, "You Can't Fire Me and I Ain't Quittin'," Living Blues 116 (July–August 1994). Houston Chronicle, April 26, 2000. Houston Press, October 21–27, 1999; May 4–10, 2000. Roger Wood, "Clarence Hollimon," Living Blues 152 (July–August 2000). Roger Wood, Down In Houston: Bayou City Blues (Austin: University of Texas Press, 2003). Handbook of Texas Online, Roger Wood, "HOLLIMON, MILTON HOWARD CLARENCE," accessed April 23, 2019, http://www.tshaonline.org/handbook/online/articles/fhobx.